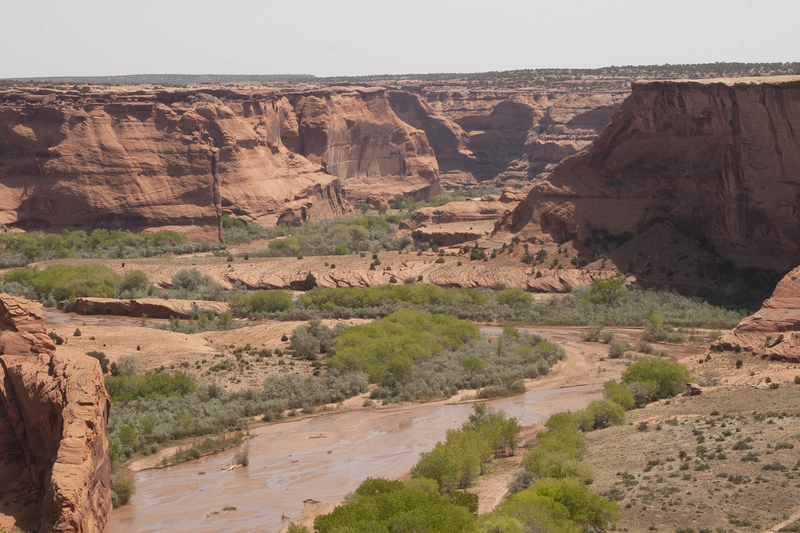 Canyon de Chelly remains important to the Navajo Nation. Canyon de Chelly (pronounced d’Shay) located 105 miles northeast of our home for the summer as volunteers for the National Park Service at Petrified Forest National Park was the perfect place for a day trip. After we visited Hubbell Trading Post we continued on to explore Canyon de Chelly. 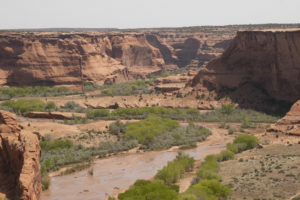 When you arrive at the entrance to Canyon de Chelly you may sign up for a tour with the Navajo guides who will bring you out to the canyon floor as a group in open back trucks or you may drive the South and the North Rims. We chose the driving tour and started on the south rim which is sixteen miles with seven overlooks all offering amazing views. We spent about two hours stopping at points of interest such as the Sliding House Overlook (Sliding House Ruins may be viewed on the narrow ledge across the canyon) TIP: bring along a pair of binoculars, Spider Rock (at 800 feet a relatively famous landmark.) The Navajo people believe that Spider Woman lives atop Spider Rock. To the right of Spider Rock is Face Rock. According to Navajo oral history Face Rock reports the names of misbehaving children to Spider Woman and carries the children to the top of Spider Rock. The only trail that you may hike into the canyon without a Navajo guide is the White House Trail found on the South Rim Drive. You should allow two hours for this moderately strenuous hike two and a half miles roundtrip from the canyon rim dropping 550 feet on a series of switchbacks to the canyon floor and the cliff dwellings. After completing the South Rim Drive back track to the visitor center and head out on the North Rim Drive traversing the rim of Canyon del Muerto. Allow two hours for this fifteen mile drive with it’s four overlooks. Spanish for “canyon of the dead” Canyon del Muerto was named when remains of mummies were discovered on an archeological expedition in the 1880’s. This drive includes a stop at the Mummy Cave Overlook, one of the largest and most beautiful ruins within Canyon del Muerto. Canyon de Chelly does have a very nice visitor center hosting exhibits about the history of the canyons and a bookstore. Year-round camping is free at Cottonwood Campground on a first-come first-served basis. Restrooms are available however there are no showers and no RV hookups. RV’s longer than 40 feet cannot be accommodated. The entrance to Canyon de Chelly National Monument is free. This entry was posted in National Parks and tagged Canyon de Chelly, Canyon del Muerto, cliff dwellings, National Monument, Northern Arizona, Puebloan Indians, spider rock, white house ruins. Bookmark the permalink.